Though the world's attention has recently been focused on the unveiling of China's first ever stealth fighter jet, the Chinese military has been busy investing in another type of furtive flyer: the humble messenger pigeon. According to reports in state media, late last year, the Chengdu division of the People's Liberation Army (PLA) began training 10,000 pigeons as part of a push to build a "reserve pigeon army" that would provide support to the military's conventional communications infrastructure in the event that war rendered its plethora of modern technology unusable. "These military pigeons will be primarily called upon to conduct special military missions between troops stationed at our land borders or ocean borders," air force military expert Chen Hong told China Central Television after the announcement. According to reports, the birds will be dispersed to communications bases across China's remote and mountainous southwestern region, particularly around the Himalayan foothills. The pigeons, flying at speeds of up to 75 miles (120 km) per hour, will be trained to carry loads of up to 3.5 oz. (100 g). The birds have a long history of service in China. Messenger pigeons have been used in the country for more than a thousand years, and pigeons have been earning their military stripes here since at least the late 1930s. In 1937 Lieutenant Claire Lee Chennault, a retired U.S. Air Force pilot, arrived in China to head up a group of U.S.-sponsored aviators known as the Flying Tigers, tasked with taking to the air to repel the Japanese invasion of the mainland. He brought with him hundreds of messenger pigeons to help with the war effort, and after the war, he left the birds behind. 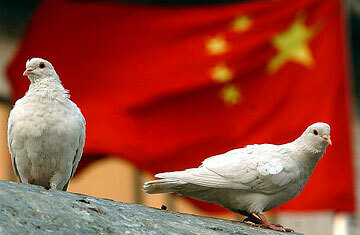 That group of pigeons would form the core of the PLA's first military pigeon brigade. Today the pigeons serve alongside 10,000 dogs in PLA service, guarding military warehouses, assisting special police forces and supporting border troops. Two thousand new dogs are reportedly signed up each year. Horses, once an important part of the military operations, have fallen out of fashion, as the PLA cavalry has played an increasingly peripheral role. There are said to be fewer than 1,000 cavalry soldiers left in the PLA, and those who remain mostly take part in exhibitions or movie shoots. The Chinese army is far from the only one to turn to these winged warriors in times of trouble. Hundreds of pigeons were dropped over Normandy during the D-Day landings to provide a communication channel back to Britain for soldiers who feared their radio messages would be intercepted by the Nazis. The first pigeon to make it back to London with the news that the invasion had been a success was awarded high military honors. Criminals, too, have found pigeons useful: in January, authorities in Colombia apprehended a pigeon that was being used by smugglers to deliver narcotics to their incarcerated compatriots. The over-burdened bird, with cocaine and marijuana strapped to its back, fell out of the sky before crossing the prison walls. In China, the birds are also used for recreation. Pigeon racing  and pigeon breeding in general  has exploded in popularity among China's upwardly mobile middle class. In late January, at a pigeon auction in Belgium, an unnamed Chinese bidder broke the world record price for a single pigeon by paying $200,000 for a pedigree Belgian racing bird, considered the crème de la crème of the pigeon racing world.